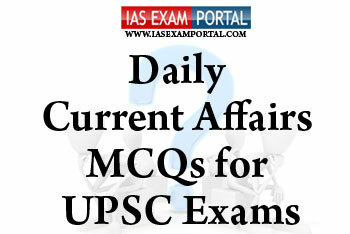 Current Affairs MCQ for UPSC Exams - 31 JANUARY 2019 | IAS EXAM PORTAL - India's Largest Community for UPSC Exam Aspirants. 1) The term bio marker refers to a broad subcategory of medical signs – that is, objective indications of medical state observed from outside the patient – which can be measured accurately and reproducibly. 2) A biomarker can be any kind of molecule indicating the existence, past or present, of living organisms. 3) A biomarker indicates a change in expression or state of a protein that correlates with the risk or progression of a disease, or with the susceptibility of the disease to a given treatment. Q3. India is the largest consumer and importer of gold,but India is not reaping the benefits from this. The government plans to bring in a national policy for gold as well in near future. Which of the followingmeasures could be adopted to allow gold to make a meaningful contribution to the Indian economy. ? 1) Drive the standardisation of gold by introducing guidelines for compulsory quality certification of all forms of gold so that buyers and sellers can have faith in both the quality and price of their products. 2) Allow Indian banks to use gold as part of their liquidity reserves. This would incentivise them to introduce gold-based savings products. 3) Create a more active marketing strategy for Indian handcrafted jewellery. This could boost exports and highlight India’s expertise in this highly-valued sector. Q4. The national conference of prison designs was held in vishakhapattanam recently, which of the following regarding the subject are true ? 1) The idea of conference was to incorporate new construction technology, Information and Communication Technologies and modern safety and security gadgets in Prison Administration, besides ensuring conducive living environment in a holistic sense. 2) Health & hygiene of inmates and overcrowding in prison were considered an important top of the conference. 3) Though as per the constitutional provision, it is a subject in the concurrent list, the govt. of India over the years has been providing all the requisite support and assistance to modernise the correctional administration system in the country. Q5. The International Energy Agency (IEA) is an inter-governmental organisation that works to ensure reliable, affordable and clean energy for its 30 member countries and 8 association countries. Its mission is guided by four main areas of focus: energy security, economic development, environmental awareness and engagement worldwide. Which of the following cities holds the headquarters of the IEA ?